Aaaaargh!!!! 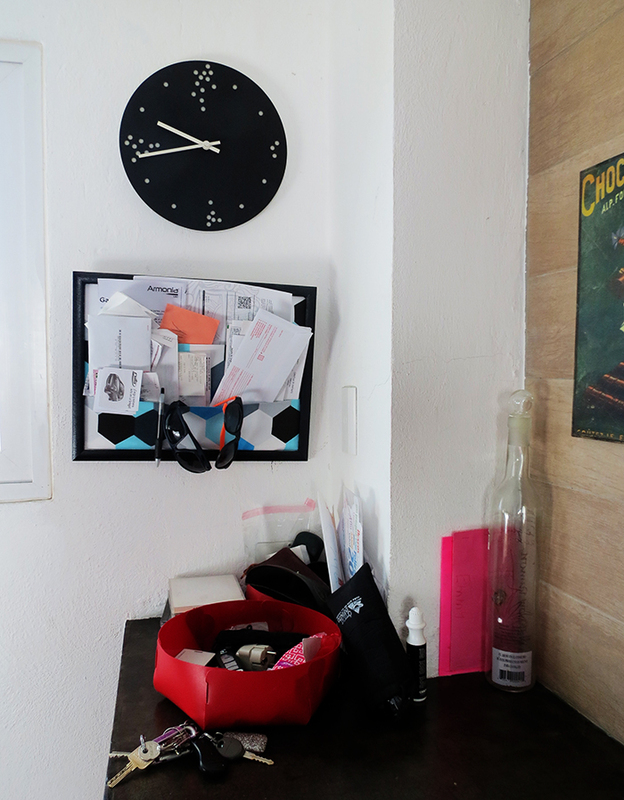 It was more than time to get everything in order. 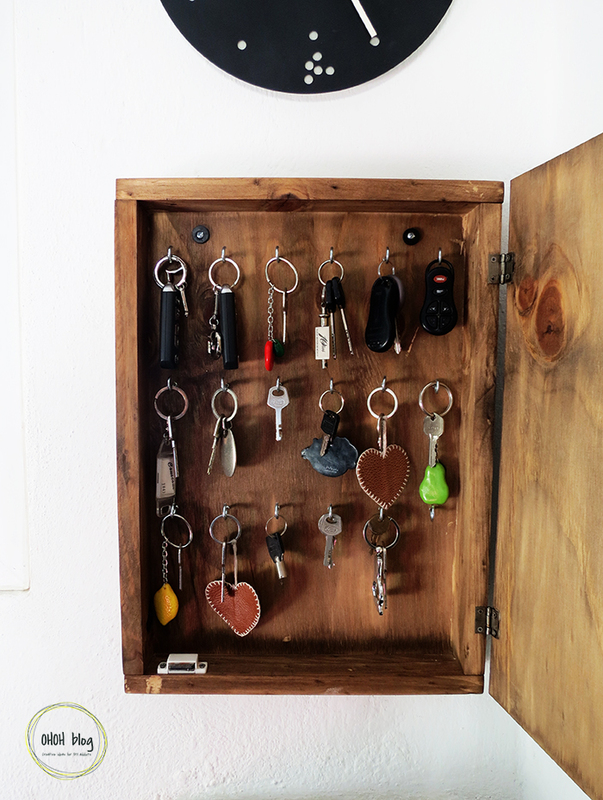 After cleaning and throwing away a few things, I made a key box to keep all the keys in one place and on hand. The box is quite big (18 hooks) so you can make it smaller if you don’t own dozen of key chains. 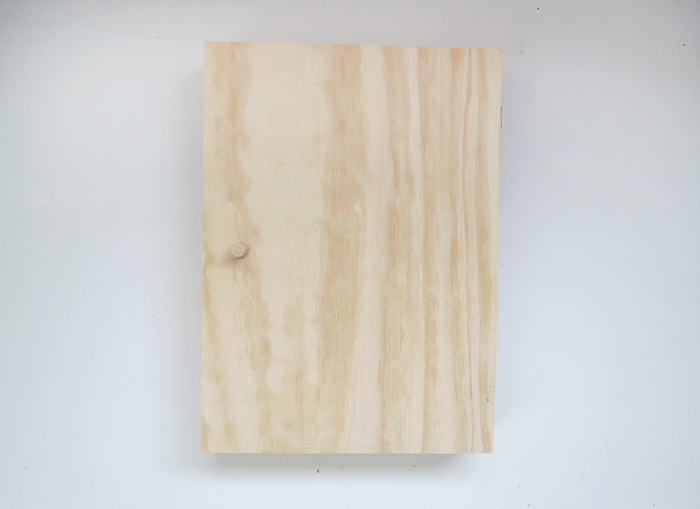 To make the back and the door of the key holder box, cut two rectangle of 18 x 13 inches (46 x 33 cm) in the plywood. 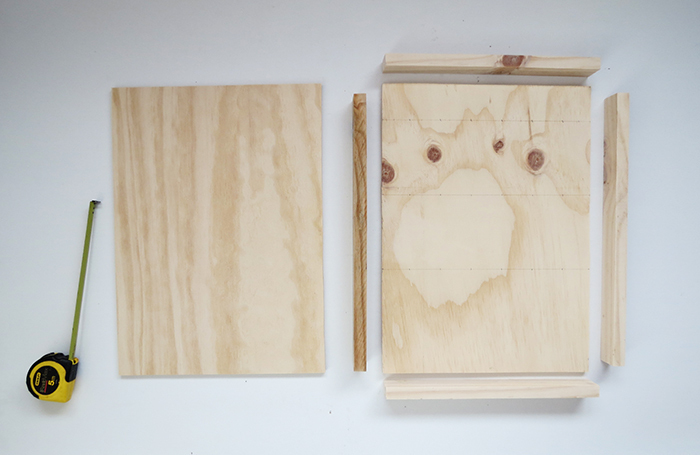 Cut for pieces in the lumber to make the box sides. Take the back piece and mark the hooks location. I made three row of 6, but you can adapt the hooks number if necessary. 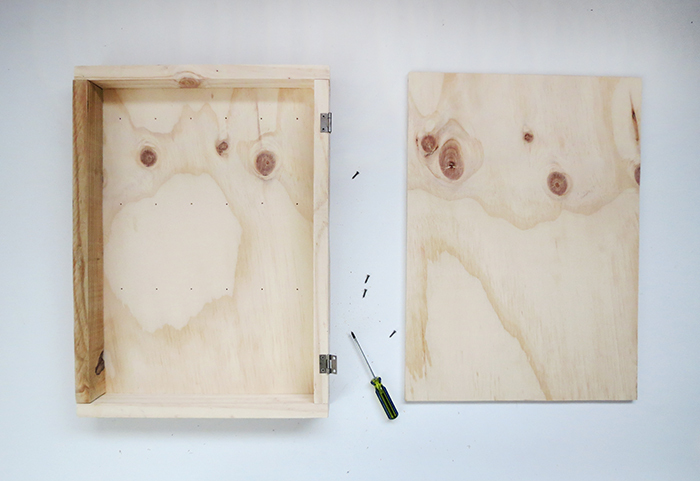 Following the marks, drill some small holes without completely perforate the panel. 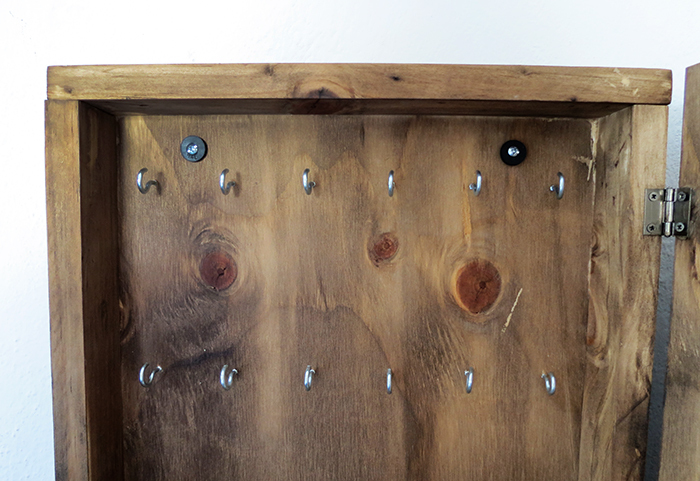 These holes will help you to easily screw the hooks later. Glue each lumber on the back panel, next to the edge. 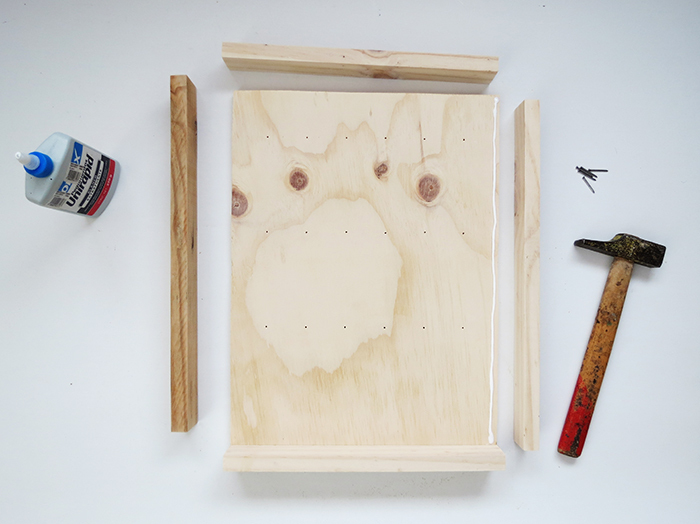 When the glue start to dry, flip the panel and put some nails all around the edge to stiffen the box. Screw the hinges on the side of the box first, and then with the door. Screw a small knob on the door. 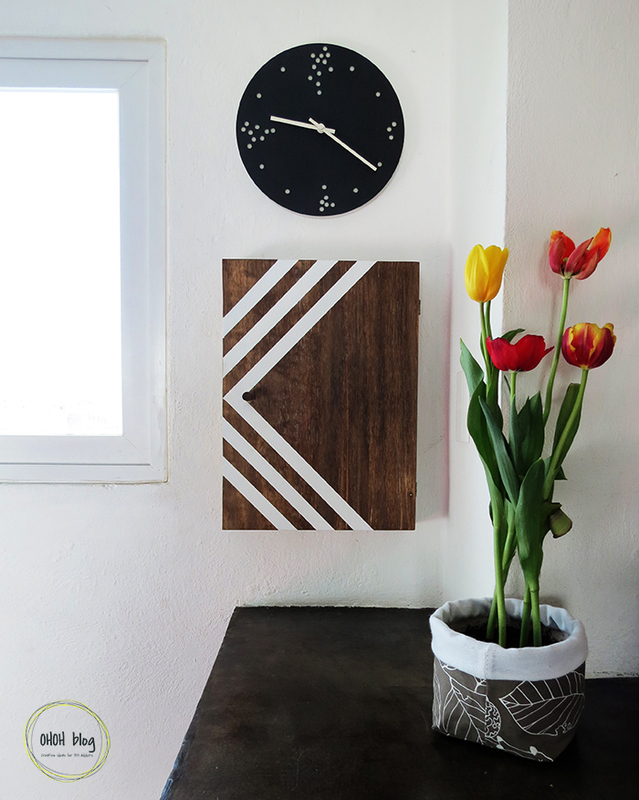 I just used a piece of dowel, but you can put a fancy one if you like too. Sand all the box. 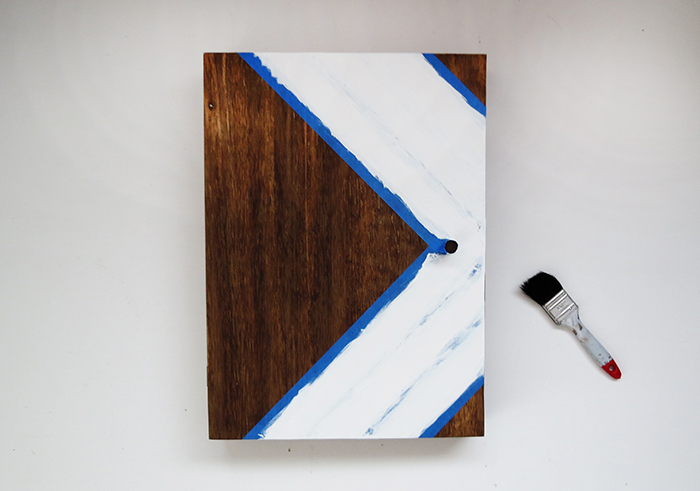 Stain, paint or varnish the box the way you like. I used an Early American shade. Once the stain was dried, I put some masking tape and paint some white lines. 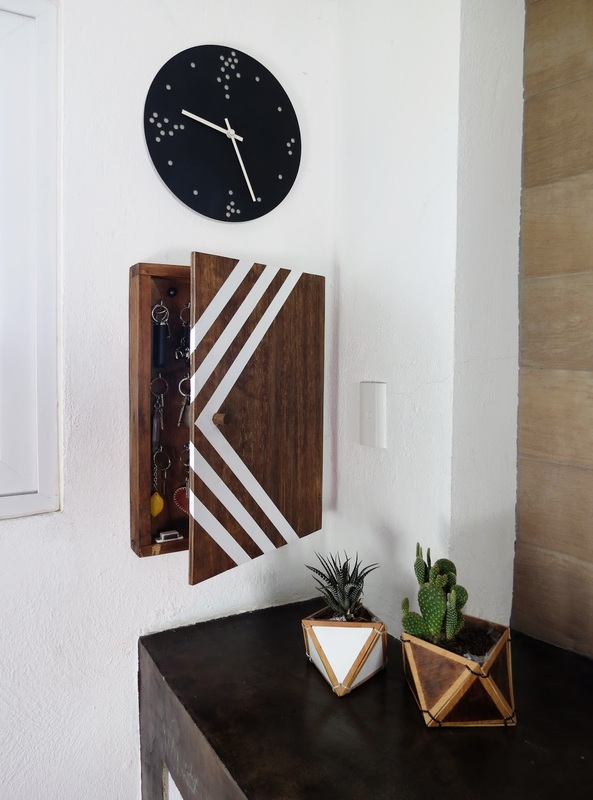 Finish by screwing all the hooks inside the box. 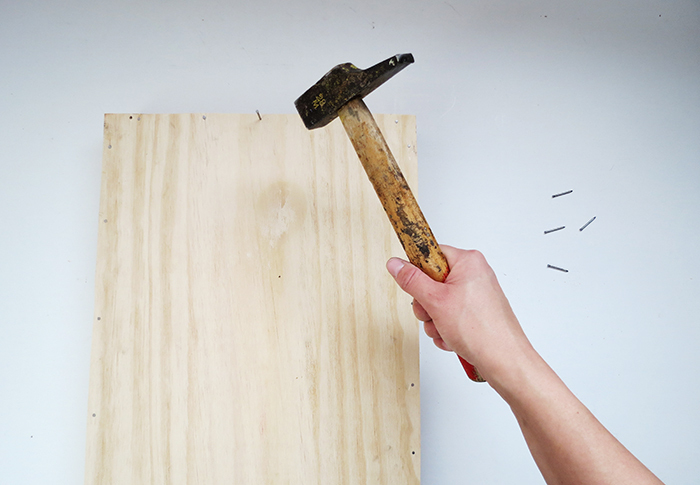 To fix it on the wall, make to holes on the back top part and screw the box into the wall. I also added a small magnetic clasps so the door remains closed. 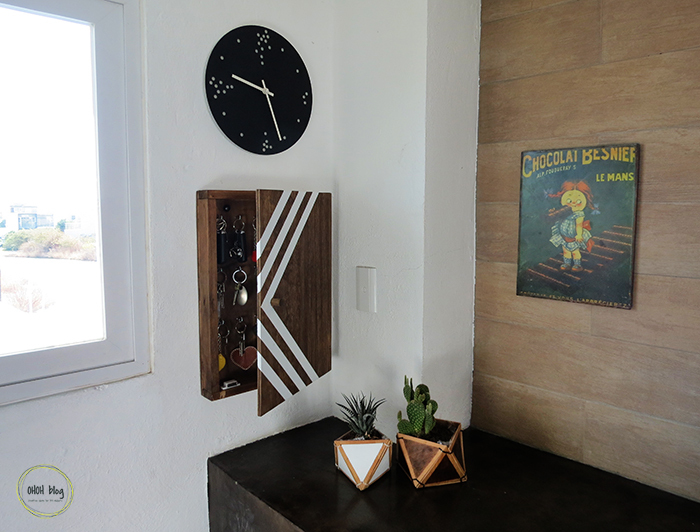 And tadaaaam, a nice and big key holder box! No mess on the kitchen counter anymore. Let’s just hope it stays that way !! If you like the cactus planters, you can have a look HERE, and the tutorial to make the fabric planter (on the first pic with the tulips) is HERE. We have too many keys….ok there is some I don’t remember what they are for. If you wonder, the fruit key chain tutorial is HERE and the leather heart key ring is HERE. Hi, I put the key holder in the kitchen because my husband think it's not safe to let the car keys in the entryway, in case we forgot to lock the door. But I agree with you it's more logical in the entryway! 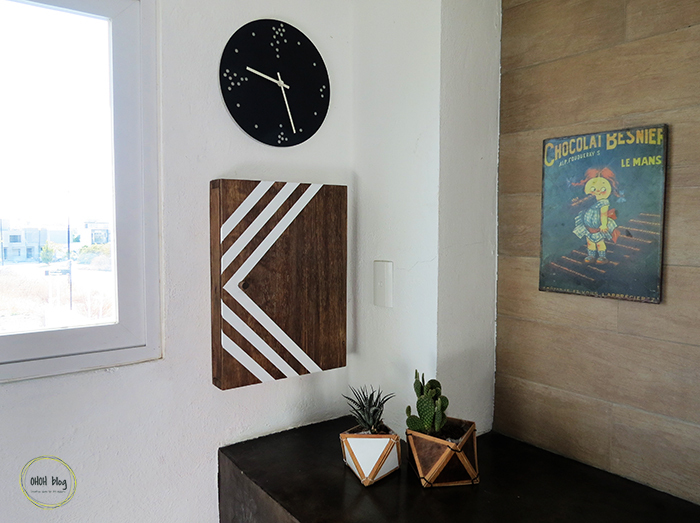 I still want to finish some stuff ( like the kitchen cabinets) before making a house tour, but it's something I definitely have in mind…it's just gonna take some time! 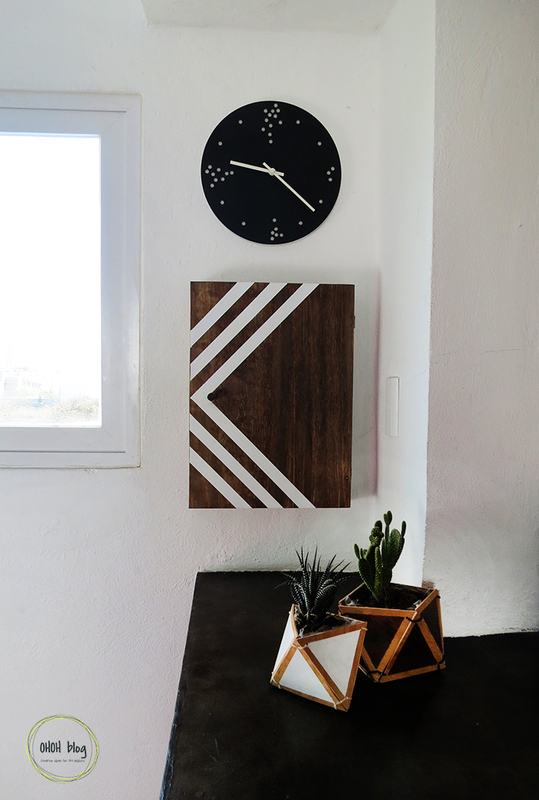 Another beautiful DIY, and it looks so much better. I am still using a thriftwood-outline-of -Australia-key holder that my grandma brought as a souvenir. 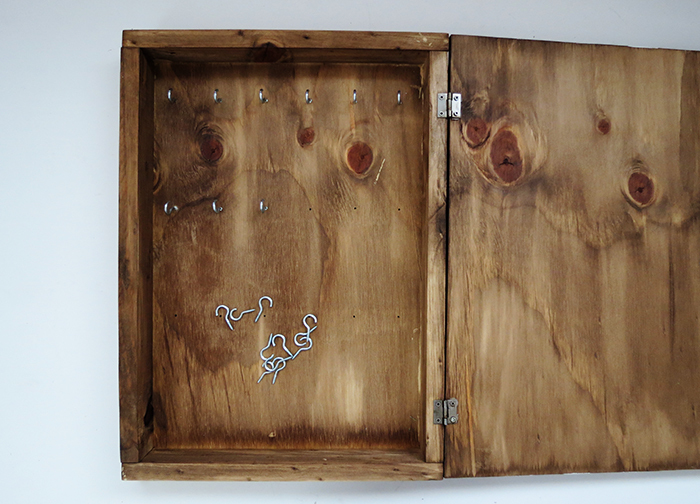 Quite stylish, but with four hooks I need to put the wayward keys in a separate box. So for the next apartment I will keep this in mind. Hi, Thank you! It's definitely way better than before! I just hope it will stay that way! Hi there, I love this. I was wondering how far apart your hooks are? Hello Melanie, the hooks are 2 inches apart from each others, and the distance between each hook row is 4 1/2 inches.